EDINBURGH, Australia. BAE Systems has been selected by the Australian government as the preferred tenderer for the SEA 5000 program to deliver nine future frigates for the Royal Australian Navy. The overall announced program is expected to be in the region of AU $35 billion (approximately $25.7 billion) for the design, build, and support of the ships. 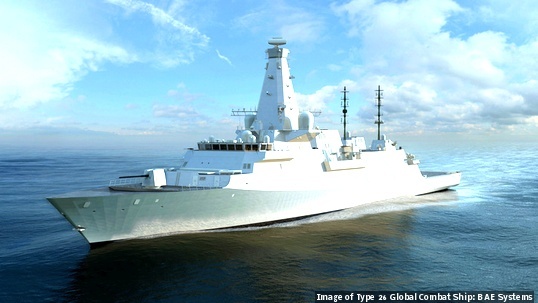 The Global Combat Ship – Australia is based on the BAE Systems Type 26 frigate, an advanced antisubmarine warship. The new ships, to be called the Hunter class, will be built in South Australia by an Australian workforce, using Australian suppliers from every state and territory. BAE Systems officials says that the project is expected to create and sustain at least 5,000 highly skilled jobs, which will be a significant contribution to the development of Australia’s continuous naval shipbuilding capability and a boost to the nation’s manufacturing industry. BAE Systems reports that ASC Shipbuilding will become a subsidiary of BAE Systems, subject to contract negotiations; through this deal, ASC Shipbuilding will be responsible for the delivery of the new ships.